Memorial Day Weekend Road Rules. It’s the start of the Memorial Day weekend which is statistically one of the busiest driving periods of the year. It is also one of the deadliest, with the Fourth of July toping it out. I just spent 30 minutes on I-35 traveling across the Kansas City metro area, and I can attest that traffic is up. It looks like a large number of people decided to get their travel started early, and with it comes a big old load of stupid. 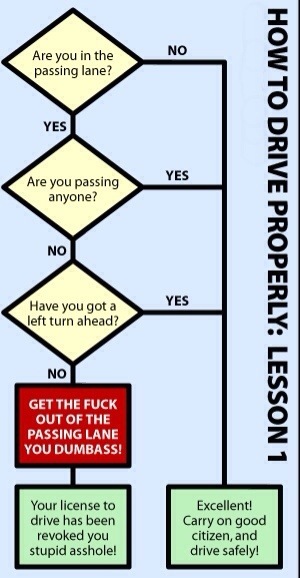 The chart below was found after doing a Google search for “Left Lane Decision Tree”. It is a simple straight forward way to determine if you should be driving in the left lane. If you don’t like bad language overt your eyes at the bottom and replace the blue phrase with “Please move to the right”. The Bottom line is this, tooling in the left lane is simply wrong. If you think you are safer, you probably aren’t. If the center lanes and right lane make you uncomfortable, maybe you should stay off the freeway and use surface streets. The highway system was designed with a specific set of rules to make traffic flow safer, faster, and smoother. Being a left lane lolly gagger just goofs it up. Oh and while your at it, put your cell phone down and try doing something equally as rewarding as texting and driving. Have a conversation with the people in the car with you. Posted in Automobiles, General and tagged Auto, Car, Driving, Highway, Holiday Travel, Left Lane, Memorial Day Travel, Road Rules on May 23, 2014 by Author. ← Paul Trillo’s “Living Moments – Lumia Arc of Wonder”.